Around our Thanksgiving menu change at Chanterelle, I start thinking about chestnuts, particularly the creamy chestnut puree we make by cooking frozen, peeled chestnuts in milk, sugar, a bit of salt and then pureeing the mixture in a high speed blender. Each year I taste and test various pastry techniques to hold and display this flavor I love so much. The most successful dish I have made with chestnuts which finds its way onto the menu in December every year is a pudding, baked creme caramel style, with chestnut puree and crunchy soaked pignoli amaretti cookies. We serve the pudding warm with a brunoise of poached pears, and a thin corkscrew of almond brittle. I have also featured the chestnut puree in a cream cheese dough baked ravioli, inside a molten chocolate cake, in an ice cream, inside a spring roll wrapper, and as the base of a souffle. And the list goes on. This year I have arrived at my favorite chestnut dessert. I have taken the creamy chestnut puree and added some cream, eggs, a bit of starch and baked it in the oven in a water bath, like a pudding. Once the tray of chestnut pudding cools and chills in the refrigerator, I use a round cookie cutter to portion a disc of the firm custard, dredge it in chestnut flour and egg whites and then deep fry it. When the pudding puffs slightly, browns, and crisps, I roll it in vanilla sugar and drizzle it with rum caramel sauce. Try it. It is crispy, creamy, warm, and quintessentially chestnut. And if you are feeling truly ambitious and have an extra 20 minutes, make some marsala sabayon to complement it as well. At the restaurant this warm oozy chestnut treat is accompanied with a roasted pear half, rum caramel sauce, marsala sabayon, candied walnuts and tart cranberries. This crispy pudding is a dessert that is best if fried right before serving. You can prepare all the components and sauces at least a day in advance. In a sauce pot, simmer the chestnuts with 2 cups of milk, 1 teaspoon of salt and 1/2 cup of sugar for 1/2 hour or until the chestnuts are soft and falling apart. Puree this mixture in a blender and store the puree in the refrigerator for up to one week or proceed with the recipe. Butter a 10” x 8” oven proof baking dish. Line it with aluminum foil and butter the aluminum foil. Find a larger baking dish that can contain the custard dish and a water bath to surround the custard dish. Preheat the oven to 325 F.
Heat the cream with the chestnut puree, stirring very frequently to avoid scalding the puree on the bottom of the pot. In a stainless steel bowl, whisk 2 whole eggs with 4 yolks. Add 2 tablespoons of sugar, 1/4 cup of powdered sugar and 2 tablespoons of flour and whisk until the mixture is smooth. Slowly drizzle the warm chestnut cream into the egg mixture, whisking constantly. Pour the custard through a fine strainer to remove any bits of hard chestnuts. Fill the prepared pan with the strained custard and place the pan in a larger baking dish or pan. Pour enough hot water into the larger pan so that the water level comes up one inch on the sides of the custard baking dish. Bake the custard for approximately 40 minutes or until the custard is set (not liquidy or loose in the center) and has a slight firmness when pressed gently with your index finger. Allow the custard to cool to room temperature and then refrigerate it. This baked custard will cool in 3 hours and then can be fried or you can store the chilled custard for up to 5 days. Once the custard is cool, take some vegetable oil and grease a piece of parchment, aluminum foil or a metal sheet pan that is large enough to hold the entire baked custard. Invert the custard onto your greased surface. Oil a 2 1/2 cookie cutter or round cutter and portion the custard into 12 discs. Over medium high heat, bring vegetable oil in a solid aluminum pot with at least 3” sides to 350 degrees. 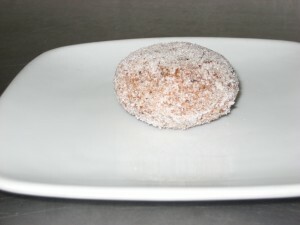 (To test the temperature without a thermometer, drop some chestnut flour into the oil. It should immediately bubble but not brown instantly.) I recommend two cups of oil in a small pot where you can fry 3 to 4 discs at a time. You can also use a bigger pan though you might need more oil. The oil should be at least 1 inch deep. While the oil is heating, dip the discs of custard in the chestnut flour and then in the egg whites and then, again, in the chestnut flour. Prepare the vanilla sugar by mixing the pulverized vanilla bean powder with 1/2 cup of sugar and place the sugar on a plate for dredging. Fry the discs on each side until they brown and puff slightly. Remove the crispy discs with a slotted spatula or spoon and rest them for a couple of seconds on a dry towel to absorb any excess oil. Roll the discs in the vanilla sugar and place on a warm plate plates. Drizzle each disc with the rum caramel sauce and garnish with a dollop of marsala sabayon. In a small, heavy-bottomed sauce pot, moisten the sugar with 2 tablespoons of water and cover, and cook over high heat until it comes to a very rapid boil. Remove the cover and continue to cook at medium high heat until the sugar has a golden brown caramel color. Stand back, remove from heat and slowly add the cream. Mixture will bubble and steam furiously. Begin whisking the caramel when the bubbling has subsided, and then let mixture come to a rolling boil. Immediately turn the sauce off. Remove the sauce from the heat and add the rum. Store this sauce in the refrigerator for up to 1 week. Warm the sauce before serving. In a sauce pot that can hold a stainless steel bowl on top, bring 1-inch deep’s worth of water to a boil. Whisk yolks with sugar in a medium stainless steel bowl that will fit over the simmering water, functioning as a double boiler. Whisk in the marsala and salt and place the bowl over the double boiler. Whisk briskly for about five minutes until the mixture has thickened, tripled in volume and holds the lines of the whisk. Remove the sabayon from the heat and allow the sauce to cool to room temperature. Fold in the lightly whipped cream and serve immediately or store in the refrigerator for up to 4 days.